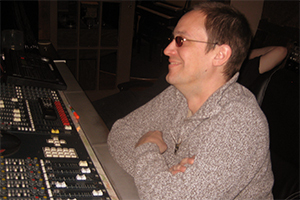 Darren Osborn has more than 30 years experience as a recording engineer and has been serving the area for over 14 years. Sandbox has a unique reputation for it's special vibe that is becoming nationally recognized and known as the place to record, mix and master your project. Set right in the middle of the USA, your home away from home, Sandbox is an oasis capable of making your experience one to cherish and remember all your life. Come to the Sandbox and build your dreams! I started learning how to play drums at the age of 3 from my older brother back in 1972. My dad, Joe Osborn, relocated from Los Angeles to Nashville, Tennessee. I remember going to sessions with him and being able to watch and learn how the professionals do everything, and watching "The Nashville A Team" is really what gave me the bug to want to pursue a career in the music industry. After that I continued to learn other instruments such as guitar, piano, and bass and I got my first paid gig at the age of 13 playing drums. Around that time my dad bought a Tascam 4-track recorder, the 246 I think it was. I recorded every chance I could get! I played drums on demo sessions around Nashville and the first big one was with Dale Hawkins when I was 15. I continued to learn more about recording by playing drums in different studios with different engineers and occasionally asking questions about engineering. I learned about mic placement, gain structure, EQ, signal path, etc. In my later teens I played drums on the road internationally with various artists. In 1989 my dad decided to relocate back to his hometown, Shreveport, Louisiana. He convinced me to come with him. I was skeptical at first but after finding out about the Shreveport players, the history, the soulful club seen, the gumbo, and the blues, it was great! I got some gigs right away. After playing a house band gig 3 years, a few of those band members and I relocated to Alexandria and built a studio there. In 1994 Dale Hawkins built a private studio in Little Rock, Arkansas and hired me to hook up gear and tune the rooms in his studio, "Hawks Nest". We recorded his CD "Wildcat Tamer". Nightwing Recording Studio hired me as an engineer in 1995 while running live sound at a local casino, and playing gigs on the side as a drummer. Then in late 1999, I met my wife Denise who was singing on the same gig. She is a fabulous singer, and in the pocket. A band can really play to her, so I asked her to sing on some demos. Denise and I, being songwriters, thought it would be nice to build a studio where we could demo our own songs. We found an old house in the artsy neighborhood of Highland, and with help from friends and family we rebuilt the house and turned it into a recording studio. After completing construction on the studio we realized it was more than just a demo studio. In other words it was much bigger than just us. So we decided to share the facility. The first recordings were with the Hoo Doo Papas, Alan Dyson, Tim Marshall, Steve Howell, Buddy Flett (featuring Kenny Wayne Shepherd), and more. These are all classics to me. Over the years we've had hundreds of great artists, musicians, and actors record here: Jack Black, Bernie Mac, Samuel L. Jackson, Forest Whitaker, and more. Without really even realizing what was happening, a lot of history was made here at Sandbox Recording Studio.